Well, this is my very last post for Nina at There's Magic in the Air. It's been an incredibly fun adventure, and Nina is a wonderful, positive, talented 'boss'. I will miss my DT sistah's as well, but it's time to let someone new fill this spot! And girls, I promise to play the challenges as often as I can! For those of you that have participated in the last two challenges, and are reading this post, please forgive me for not getting to your blogs to comment. I actually timed one blog comment that I made last week and it came in at 47 minutes. Obviously, I can't retain my sanity at that speed! Thanks to Shirley for allowing me to use her computer to print this weeks image!!! You are the best!!! And thanks Nina, for being SO understanding and sweet the last couple of weeks! 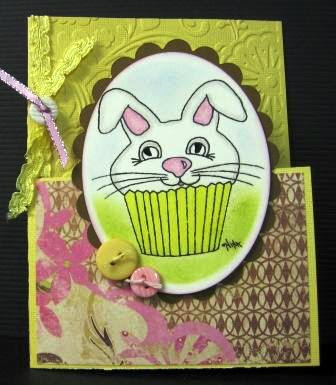 Today's challenge at There's Magic in the Air with Paper Cupcakes comes from Sue Walsh. 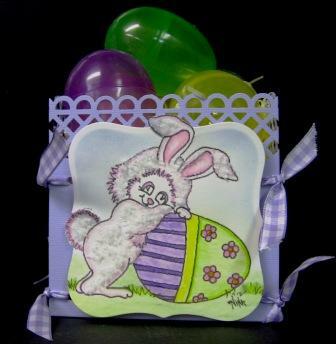 Sue wants us to use this week's image, "Eggs-traordinary Find" and create a paper basket. She has included several sites to visit that include directions for adorable baskets. However, as you know, my computer won't really allow that, so here is what I did - easy peasy! I cut two strips of orchid CS that measured 4" x 12". I scored these both at 4" and 8". I used the wide trellis punch from Martha Stewart on all four ends. I punched two holes at the top and two at the bottom on each side. I then laid one strip on top of the other, forming a plus sign. Fold the edges up, run a ribbon through the holes, and voila! Easy peasy! All coloring is done with Koh-I-Noor pencils and LOMS. White polar Flower Soft was added to bunny for some fluff!!! Hope this gives you a smile today! Don't laugh at my empty eggs! If I fill them too soon, guess who will eat the props??? Yup - ME! I do have some good news! We received an e-mail, saying that our new computer will be delievered TODAY!!!!!!! My guess is that it will take a week or so (with DH's travel schedule) to get the data transferred from one computer to the other, but hopefully, by this time next week, things will be looking much brighter! Yippee!!! I'm going to attempt to post two cards tonight. 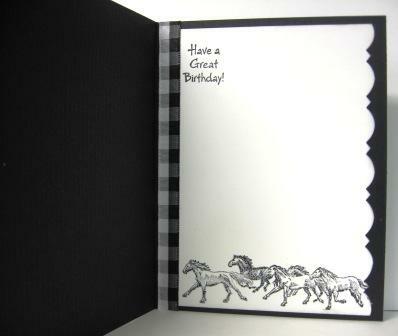 The first is just a card that I made for a friend of ours that is having a birthday on Saturday. The stamps are Inkadinkado, that I purchased at O'Dear's. 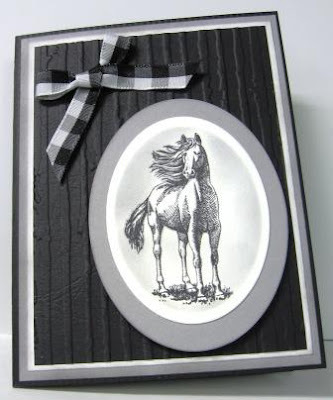 The ink is Tim Holtz's Distress Ink, Black Soot. Other than that, I used a cuttlebug embossing folder, a nestie, and a scrap of ribbon. Since I have been unable to 'blurf' and check out challenges, I am not entering this anyplace. 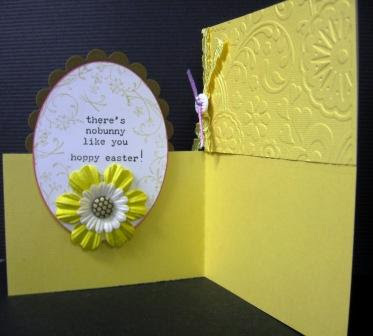 The next card was made for Heather's challenge over in the land of Oz! Again, I couldn't actually look for challenges this week, but this one came to my in box, so I followed it home! It's a sketch challenge... I used TAC's Wonder and Joy set, and some scraps from my paper bins that are also TAC. The sweet little gal's dress was paper pieced and I dotted the lace with my glitter pen. Thanks for stopping by, and for continuing to leave such kind words, even though I can't return the favor! I promise that I will make it up to all of you! I will be SUCH a pest when I get a computer!!! Hugs to all - see you soon! First, I want to thank all of you who are still 'hanging out' with me while I have no computer, and can only post silly updates on smelly dogs! I've been promised that the new machine will be here soon! I promise to be a better blogging friend when it gets here. So, update! I took Flake to the groomer yesterday, and they were like a well oiled Trauma team in the ER. There was NO dallying, they took her in immediately and went to work on making her pretty again. A few hours later, I can say that this was the best $33 that we ever spent! I wouldn't wish this experience on anyone, and will never take it lightly again! Lol..., my friend Shirley and I had to pick up some things that I had ordered, and we did that yesterday. At the end of the day, Shirley very quietly told me that I smelled better than I had earlier that day! OMG, I was so embarrassed! I didn't even know that I stunk! I'd gotten out of the shower, dried my hair, put on clean clothes, used rubber gloves to touch dog's collar to attach leash, and stayed completely away from her. I opened ALL windows and the sunroof on the car on our drive to the groomer, and we took Shirley's car on our trip. Sheesh..... skunks are N*A*S*T*Y*!!!!!!!!!!! Well, that's all for now. It's taken this old IBM almost one hour to let me get this typed. I've had all the fun I can stand for now! I'll be back soon! Have a wonderful day, dear friends!!! So...last night at bedtime, dear doggie Flake tangled with a skunk! I opened the door to let her out. She went out to do her business, barked twice, and before I could even call her back in, she yelped, and it was too late! She now has this horrendous odor about her that will not bathe off. I'm waiting on baited breath (actually, with a towel folded over my face) for the vet's office to open to find out what I can do. I have no tomato juice in the house, and really don't know if I could bathe her by myself or not! I'm hoping the vet's office will say 'bring her in and we'll bathe her for you'...ha. right. Poor thing, she didn't even eat her bedtime snack - it's still in her dog dish! If I can get this computer to work later, I will update you all - I'm sure you are just SO anxious to hear the outcome of this story! I'm at least 'funcional' for a while. DD had an old IBM that she told me to try using while my machine is ka-put. It gets very hot very quick, so this will probably be very short. It's another Magical Monday at There's Magic in the Air with Paper Cupcakes! 1 Acquired Paper Cupcakes Image, 2 Ribbons, and 3 buttons on our projects. Since I couldn't participate last week, I used the image from last week's challenge, AND I used Kim's challenge of a non-traditional card, AND Olga's challenge for this week! I was looking at the Scrap and Stamp Arts magazine last week, and saw this concept for a card. You cut about 2 5/8" of your card front to the fold line. The top half is then glued to the card back, and the bottom half swings open and shut. I thought it was a cute idea! All coloring is done with colored pencils and LOMS. The DP is TAC's "More Mimi". I apologize for the quality of the photos - the color is just awful on this screen, so I can't tell what it really looks like! Hope all is well, and that you have a good weekend!!! Thanks for stopping by, and for being so patient with my down time! It will be at least a week before I have a machine again. We ordered DH a new laptop, and I'm to get his old one when the new one comes in. Well, hello, and happy Saturday! I thought that since this loaner computer is working today, I should draw for the Nesties that I posted a few weeks ago. I never dreamed it would have taken so long for me to give them away! Congratulations Kim! Please email me at: mamagilliam@gmail.com with your mailing address!!! I'll get these out to you next week! 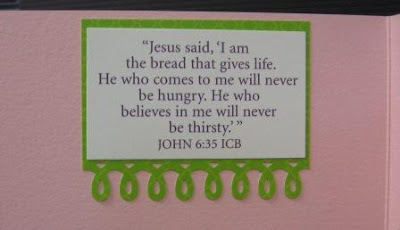 e needed a First Communion card for a little girl that we know. My friend Shirley reminded me about this new TAC set. I was only to eager to run over and borrow it from her! 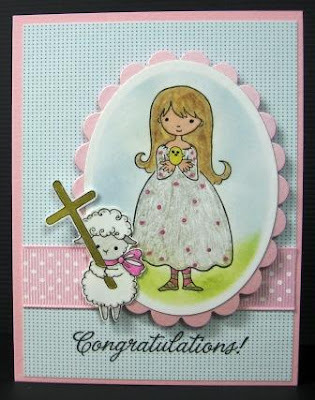 I think this is one of their cutest sets - I just adore the little lamb with the cross! Anyway, here is my card! Very quick - skin color was done with a Stamin' Up marker, dress was colored and dotted with Sakura Gelly Roll Glitter Pens, as was the bow on the lamb. The DP is from the Stampin' Up Welcome Neighbor 6 x 6 pack. Hope you like it! The screen is SO dark that I can't tell about colors and brightness. Thanks for being patient with me, and again - Congratulations to Kim!!! PS - I'm going to enter this at Other Lovelies - the challenge there is to use an Easter animal! The "mother" of all problems! In the meantime, check this out!!! 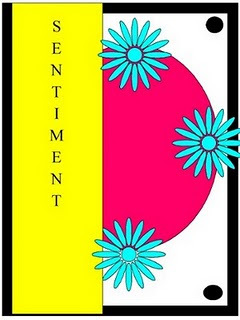 Beth Norman, at Sunflowers & Dragonflies has chosen me as reader of the week! How exciting! (And how ironically funny that I'm featured on a week that I can't read!!!) Thanks so much, Beth, for thinking of me! I love the Sunflowers and Dragonflies store! If you haven't checked it out, be sure to do so! You won't be disappointed!!! Okay, gotta get off of this machine! Take care everyone! Hopefully, my next post will have the Nesties winner! My computer has crashed. I am at the repair shop now, using one of theirs so I could get this posted. I will draw for the nesties as soon as I get my machine back - next week sometime. Olga, I will put you in - sorry!!! Take care everyone - have a good weekend! I needed a little something for a friend that has an upcoming birthday, so I thought that I'd use TAC's new set, "Wonder and Joy" for the focal image. I just love the darling little kids in this set! I've colored with Koh-I-Noor, used a black gel pen for the eyes and mouth on the balloon and the little girl's eyes. Obviously, she was too long to fit in a nestie, so I trimmed at the bottom and top until most of her would fit, and just let those parts lay on the outside of the nestie rim. The hat on the sentiment stamp inside of the card (Studio G.) is paper pieced with the same cardstock as is on the front, but like the little card at the top, it's made from the back side of this fabulous two sided CS by Chatterbox! I used the Martha Stewart "Loopy" edge punch on both sides, but on the left edge, I clipped off the 'loops'. I hope she makes you smile - she's such a little cutie! Here are a couple of photos of our old, sad, kitchen. The countertops were removed yesterday, and new ones were installed, but you can't see the new counters until the cabinets are painted, the walls are painted and tiled, and the new flooring is down, so it will be a long while coming!!! Have a good night! Don't forget to register to win the set of Nesties! DH has another Dr. appt. on Friday -I may not get to draw until later in the day! Good luck, everyone! Another church blooper: Ladies, don't forget the rummage sale. It's a chance to get rid of those things not worth keeping around the house. Bring your husbands. Happy Birthday to me & Happy Anniversary to Us!!! Woo hoo! Got my birthday present and our 37th anniversary present a month EARLY! Just have to tell someone! I'm going to a Casting Crown's concert!!!! Talk about excited - I guess I may as well go paint something, because I certainly can't sit still!!! Thanks DD and DH - you guys ROCK! Back later with a card... have a great day! Yikes! After the comments so far, I should say again, that today isn't my birthday - this is an EARLY gift! B'day is April 3rd, and Anniversary is April 7th! Thanks!!! With St. Patty's Day quickly approaching, our challenge at There's Magic in the Air this week uses Nina's adorable "Pot of Gold" image. When you drop by at There's Magic in the Air today to pick up your free image, be sure to wish our Nina a Happy Birthday! She tried to keep it a secret, but that didn't work! Nina, if you are reading, Happy Birthday, dear friend! As you can see, I've added a brad to the center of my flower. As for the green and gold, my CS is green, my ribbon is green, and my tag is matted with beautiful shiny gold CS! I thought of all of you when I used this sentiment! I saw this stand up card featured on Beate Johns' blog a while back, and just had to try it! If you've never visited Beate's blog, it is a 'must do'! She features the nicest video tutorials. Beate explains things so nicely that even I can do them!!! Hope that you like this - it was fun to do, and you can find the tutorial on Beate's blog, or in the resources section at Split Coast Stampers. I may be a bit scarce this week. DH injured his knee last Thursday, and we have an appt. with a specialist tomorrow, and our new kitchen countertops are coming on Tuesday afternoon, so I will have a lot of work to do in the kitchen on Tuesday morning! Afterwards, there will be tons of damage control (clean up, etc....)! Have a Magical Monday, and a great week! Our daughter's blog, Small Town Girl's Guide, is just what the title depicts. She loves to travel to towns and places that she's never been to, and blog about them. There are so many wonderful small towns just in our area alone that I've never heard of. It's fun to see her discover and write about them. Two towns, Cuba, Mo., and St. Charles, Mo., (here are the links to the articles) have both featured articles that she posted on her blog on THEIR city blogs today. Wow! With that being said - this card is an on-line greeting for her! Melissa, we are so proud of you - you rock! I used the sketch from For Fun Challenges for this card, taking the liberty of flipping it, putting the sentiment on the bottom. I had this amazing ribbon that was so perfect, and this stamp says it all! Thanks for taking the time to stop by today! What a wonderful day it is in Missouri today! The sun is shining, and I think it must be in the upper 40's again. Sheer delight! Don't forget to go here to leave a comment and have a chance to win my Nesties! Above is a trio of cards for you today! 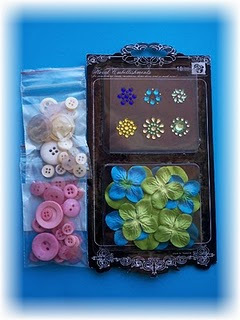 I purchased the Sprin Florals kit from Gina K. Designs, and it came with a free card kit, by Jessica Fick! How exciting is that - I love, love, love FREE! This set comes with the following sentiments: Deepest Sorrow, Easter Blessings, With Gratitude, Birthday Wishes. I didn't know who I would be sending these to, so for now, I didn't add a sentiment. That will be added prior to mailing! Sunflowers and Dragonflies: Use the Wisped Frame Technique that is featured in the February edition of the Technique Junkie newsletter. If you don't subscribe to this, you really should! It is a fabulous resource! Beth would love to have you participate in the challenge this week! Other Lovelies: Since it's been an unseasonable and unreasonable winter, Suzanne wants us to brighten and/or warm our projects this week. Be sure to jump in and play in the challenge this week! Lexi's Creations: Anything Goes - great challenge blog - give it a try this week! I hope that these beautiful cards make you feel all warm and fuzzy! I wish I could take credit for them, but the credit goes entirely to Jessica! I simply, stamped, colored, and assembled what she designed! All righty - here we go! Because I am so silly, I somehow managed to purchase the large scalloped circle Nestabilities set twice! Yep, twice! I was organizing some things today, and realized that I had two of the same set. SO, my silliness will be the good luck of someone else! All you have to do to be entered to win these dies is leave me a nice comment on this post. If you don't already follow, it would be fun if you signed up to follow, but you will be entered either way. Obviously, these are not 'new in package', but they are very gently used, and I would love to see them go to someone that does not have this set! I will draw a winner next Friday, March 12th, first thing in the morning! Have a great night, and good luck to all who enter! Gina K. posted this on Facebook today, and I thought it very worthy of passing along. After tossing her books on the sofa, she decided to grab a snack and get on-line. She logged on under her screen name ByAngel213. She checked her Buddy List and saw GoTo123 was on. She sent him an instant message: ByAngel213: Hi.. I'm glad you are on! I thought someone was following me home today. It was really weird! GoTo123: LOL, You watch too much TV.. Why would someone be following you? Don't you live in a safe neighborhood? ByAngel213: Of course I do. LOL I guess it was my imagination cuz' I didn't see anybody when I looked out. GoTo123: Unless you gave your name out on-line.... You haven't done that have you? ByAngel213: Yes, and we won!! ByAngel213: We are the Canton Cats. We have tiger paws on our uniforms. They are really cool. ByAngel213: No, I play second base. I got to go. My homework has to be done before my parents get home. I don't want them mad at me. Bye! Meanwhile........GoTo123 went to the member menu and began to search for her profile. When it came up, he highlighted it and printed it out. He took out a pen and began to write down what he knew about Angel so far. Her name: Shannon Birthday: Jan..3, 1985 Age: 13 State where she lived: North Carolina Hobbies: softball, chorus, skating and going to the mall.. Besides this information, he knew she lived in Canton because she had just told him. He knew she stayed by herself until 6:30 p.m. every afternoon until her parents came home from work. He knew she played softball on Thursday afternoons on the school team, and the team was named the Canton Cats.. Her favorite number 7 was printed on her jersey. He knew she was in the eighth grade at the Canton Junior High School . She had told him all this in the conversations they had on- line. He had enough information to find her now. Shannon didn't tell her parents about the incident on the way home from the ballpark that day. She didn't want them to make a scene and stop her from walking home from the softball games. Parents were always overreacting and hers were the worst. It made her wish she was not an only child. Maybe if she had brothers and sisters, her parents wouldn't be so overprotective. By Thursday, Shannon had forgotten about the footsteps following her. Her game was in full swing when suddenly she felt someone staring at her. It was then that the memory came back. She glanced up from her second base position to see a man watching her closely. He was leaning against the fence behind first base and he smiled when she looked at him.. He didn't look scary and she quickly dismissed the sudden fear she had felt. After the game, he sat on a bleacher while she talked to the coach. She noticed his smile once again as she walked past him. He nodded and she smiled back. He noticed her name on the back of her shirt. He knew he had found her. Quietly, he walked a safe distance behind her. It was only a few blocks to Shannon's home, and once he saw where she lived he quickly returned to the park to get his car. Now he had to wait. He decided to get a bite to eat until the time came to go to Shannon 's house. He drove to a fast food restaurant and sat there until time to make his move. Shannon was in her room later that evening when she heard voices in the living room. "Shannon, come here," her father called. He sounded upset and she couldn't imagine why. She went into the room to see the man from the ballpark sitting on the sofa. "Sit down," her father began, "this man has just told us a most interesting story about you." Shannon sat back. How could he tell her parents anything? She had never seen him before today! "Do you know who I am, Shannon ?" the man asked. "No," Shannon answered. "I am a police officer and your online friend, GoTo123." Shannon was stunned. "That's impossible! GoTo is a kid my age! He's 14. And he lives in Michigan !" The man smiled. "I know I told you all that, but it wasn't true. You see, Shannon , there are people on-line who pretend to be kids; I was one of them. But while others do it to injure kids and hurt them, I belong to a group of parents who do it to protect kids from predators.. I came here to find you to teach you how dangerous it is to talk to people on-line. You told me enough about yourself to make it easy for me to find you. You named the school you went to, the name of your ball team and the position you played. The number and name on your jersey just made finding you a breeze.."
Shannon was stunned. "You mean you don't live in Michigan ?" He laughed. "No, I live in Raleigh . It made you feel safe to think I was so far away, didn't it?" She nodded. "I had a friend whose daughter was like you. Only she wasn't as lucky. The guy found her and murdered her while she was home alone. Kids are taught not to tell anyone when they are alone, yet they do it all the time on-line. The wrong people trick you into giving out information a little here and there on-line. Before you know it, you have told them enough for them to find you without even realizing you have done it. I hope you've learned a lesson from this and won't do it again. Tell others about this so they will be safe too?" "It's a promise!" That night Shannon and her Dad and Mom all knelt down together and thanked God for protecting Shannon from what could have been a tragic situation..
Labels: On-Line Story from Gina K.
Susanne, at Other Lovelies, issued a challenge this week to use up what we've been hoarding. Well...hooray! I had some scraps from a class project almost two weeks ago laying on my desk, and a piece of ribbon about 1" long that was in my ribbon scrap pile that I just couldn't get rid of. Even though it was only 1" long, I figured that sooner or later I would be able to use it for something! Thanks Suzanne! Here's my card for this week's challenge! My best stampin' bud, Shirley, and I, went to St. Louis on Friday to take a class with Michelle Zindorf. Talk about a master at what she does! Wowzers! And she made it look so stinkin' easy! Here are the three cards that we made at this wonderful class. My cards don't 'show' nearly as well as Michelle's, but remember, they were from the beginner class! I intend to practice and get better, really!!! Okay, peeps, got a swap to finish up! I'll be by in a bit to see what you are up to! Hugs and blessings - Patti J.
Monday's get here SO fast! Well, at least we have a little Magic to look forward to on Mondays! Welcome to another Magical Monday at There's Magic in the Air with Paper Cupcakes! Our challenge is brought to us today by our very talented hostess, Patti Nelson. 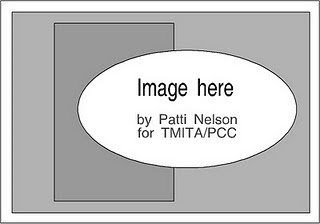 Patti has given us a sketch to use with any of Nina May's images that we have acquired already. This sketch can be stretched, rotated, flipped, etc., as long as the original sketch can still be seen. As soon as I saw this sketch, I knew I had to use the "Beached Boat" image. It was perfect for the oval in the sketch! The DP is from my stash, and as usual, I've colored with Koh-I-Noor pencils and LOMS. I hope that you will head over to TMITA/PCC and grab the sketch! Create your card using any of Nina's images that you have on hand, and hurry back over to enter it in the challenge! You could win something fun! Have a great week - hope it's Magical!